Amnesty International and members of local bands will stage "a guerrilla performance" outside the Russian embassy Friday. They're there to show their support for three members of a Russian punk group called P***y Riot who have been held in pre-trial detention since March. And no, the asterisks are not really part of their name. Maria Alekhina, Nadezhda Tolokonnikova, and Ekaterina Samusevich are facing serious criminal charges of "hooliganism" for their alleged participation in a "guerilla punk rock performance" at Christ the Savior Cathedral in Moscow. On February 21, members of P***y Riot entered the Cathedral with their faces masked by balaclavas and performed a calling on Virgin Mary to become a feminist and banish Vladimir Putin. They also criticized the dedication and support shown to Putin by some representatives of the Russian Orthodox Church. Reps from Amnesty International, Philippa Hughes of the Pink Line Project, and Mark Andersen of Positive Force D.C. will discuss the human rights aspects of the case and the need for free artistic expression. D.C. band Brenda will perform in tribute to P***y Riot. The detained women, two of whom are mothers of young children, could face up to seven years in prison if they're found guilty. 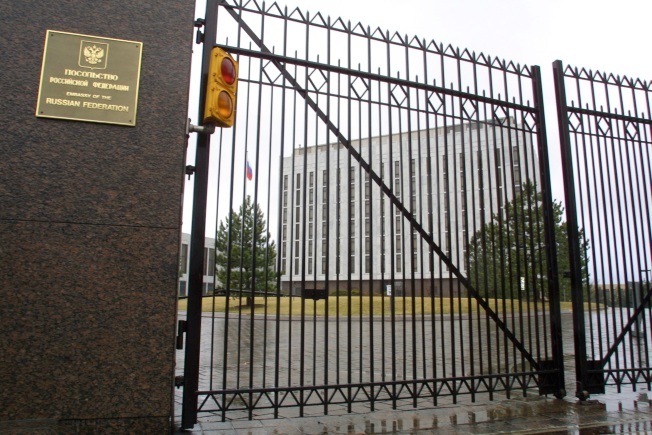 The protest will take place from 4:30 to 6 p.m. outside the Russian embassy at 2650 Wisconsin Ave. NW.